More than 250 guests flocked to its presentation gallery, where valet parking, champagne and cocktails and canapés awaited. The building was filled with the jazzy sounds of Brian Browne on keyboard and Kelly Craig on trumpet, with catering provided by DISH (it’s just hired award-winning chef René Rodriguez). The gallery, located on the future building site at Wellington Street West and Island Park Drive, gave guests a sense of what the finished product will look like, from elegant crown mouldings and baseboards to marble countertops and high-end appliances. 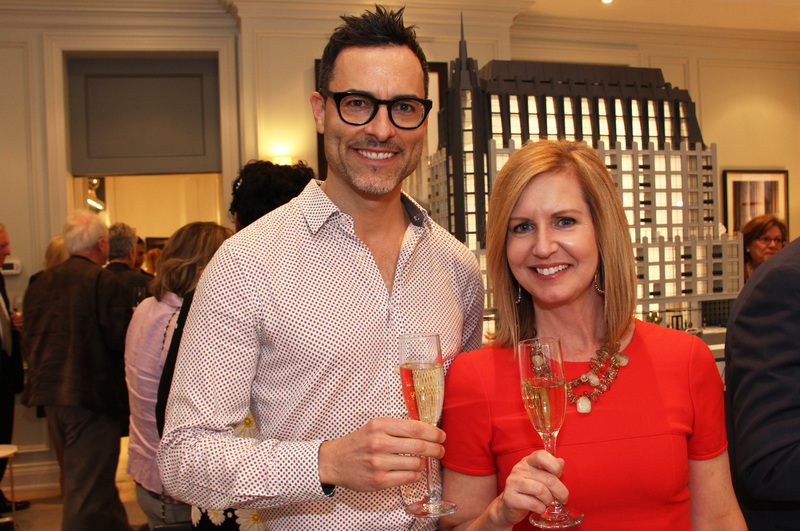 “I couldn’t be more proud tonight to display and showcase what we’ve done here and what we’re doing,” Sam Mizrahi, president and founder of Toronto-based Mizrahi Developments, told a plethora of purchasers and potential purchasers during some brief remarks. Mizrahi was joined by architect Henry Burstyn, associate director of Page + Steele/IBI Group Architects, and renowned interior designer Brian Gluckstein, principal of Gluckstein Design. Attendees included Ted Fobert from the city’s biggest planning consultancy, FoTenn, and such local designers as Jason Bellaire and Denise Hulaj, who were curious to see Gluckstein’s work. The room heard how the building design is a reflection of the extensive collaboration that took place between the developer, the city’s planning department and surrounding neighbours. City councillors initially rejected the building's proposal over height concerns, but the developer appealed the decision to the Ontario Municipal Board where it received the green light. In reviewing the design, OMB required that in order for the condominium to stay at 12 storeys tall, the design needed a more landmark appearance. 1451 Wellington, slated to be completed in June 2021, has officially been designated a landmark building by the Urban Design Review Panel in Ottawa. The condo will have a distinctive copper mansard roof and pale limestone exterior, the room heard. The site will also have a parkette with a playground. Interested buyers included empty nester and recent widow Michelle Bégin, from the family-run business Valley Flowers. She said she’s ready to downsize from her house in posh Rockcliffe Park, now that her four kids have grown. Condo living would also suit her travel lifestyle. “It’s probably the most beautiful building I’ve ever seen in Ottawa,” she told obj.social. For criminal lawyer Doug Baum and his wife, Ülle, such a purchase would be a lifestyle decision; one that offers such services and amenities as 24-hour concierge, an indoor lap pool, on-site car wash, pet service station, kitchen-equipped entertainment suite and other five-star features. That’s not to mention the shops, restaurants, cultural destinations and waterfront green space located within walking distance of the building, which straddles Westboro and Wellington West. Still, one cannot help but think: What if you build an exquisite condo building and nobody buys? It ain’t going to happen, according to Mizrahi. The company did a soft launch a couple of months before its official opening and sold more than 30 per cent of its 93 units. Fair enough, Mr. Mizrahi, but what if the sales stall because the Ottawa market just isn’t deep enough or is hit by a housing slowdown? He's confident there will be at least 90 buyers in a city of about one million people. The condo won’t even require that many in the end, as some purchasers are combining units, reducing availability down to about 60 or 70. Also out for the opening was Jayne Watson. She’s the head of the National Arts Centre Foundation, which counts Mizrahi and his wife, Micki, who’s from Ottawa, among its supporters. That’ll teach him to favour the La-Z-boy. By the way, units range in price from the high 400s to more than $3 million.